Huge Savings Item! Free Shipping Included! 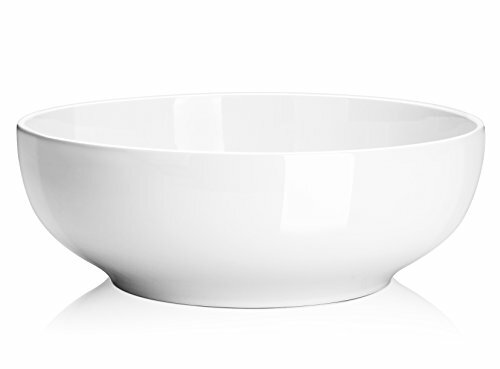 Save 17% on the (2 Packs) DOWAN 2-1/2 Quart Porcelain Serving Bowls - Salad/Pasta Bowl Set, White, Stackable by DOWAN at Foom App. MPN: 010503170504105. Hurry! Limited time offer. Offer valid only while supplies last. SAFE AB-GRADE PORCELAIN - FDA approved, Cadmium and LEAD free, microwave, oven, refrigerator and dishwasher safe. The long-lasting material blocks moisture absorption and prevents cracking, crazing and rippling. VERSATILE&ALL ROUNDER - strong contemporary shapes co-exist alongside fuss-free softer lines - perfect for everything from every day to special occasions. Ideal for salads, vegetables, chili or curry and pasta dishes. Also great as a buffet and BBQ staple for serving breads, crisps and tortillas, pasta and rice salads or maybe even fruit punch. DESIGNED TO LAST - Expertly designed and manufactured by skilled craftsman, the large serving bowl is tested for its sturdiness and longevity. It can survive within your family for generations. A MUST-HAVE FOR BIG DINNER - Keep your cupboards always stocked for a dinner party or family meal with the DOWAN serving bowl set. With two white serving bowls, you'll be able to serve chips, dips and anything in between. These microwave- and dishwasher-safe bowls keep preparation and cleanup as quick and easy as can be. 30 DAY MONEY BACK GUARANTEE- We will offer a refund or a free replacement if you receive a damaged or defective item. Please feel free to contact us.